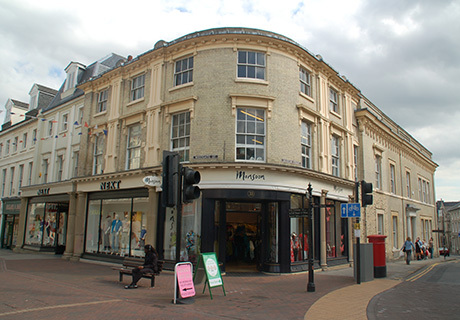 A group of Victorian buildings housing a series of small shops and offices concealed the walls of Seckford Palace. This large and distinguished Tudor house had once been set in its own grounds on what were then the outskirts of the town and had rivalled the nearby Christchurch Mansion as a display of wealth and influence. The historical significance of the site and the complexity of the later buildings were such that a total of eleven separate planning permissions and other consents were required before work could begin on site. The location of the site is such, however, that an ambitious scheme was justifiable in order to increase the retail floor area and attract national operators such as NEXT and MONSOON. Clerical Medical Managed Funds Ltd. The proposals included the complete re-modelling of the main street elevations, the re-building of two of the Victorian buildings, demolition of buildings to the rear of the site and the insertion of a steel frame structure to create an additional 13,000 sq. ft of retail space on two floors. 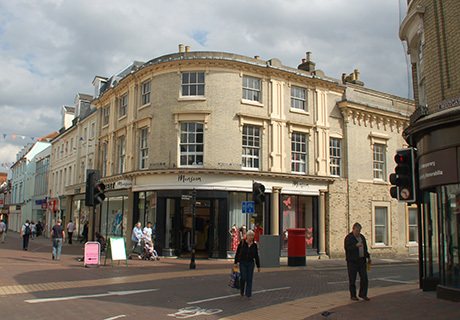 The reconstructed stone columns to the shopfronts were re-cast and steelwork inserted into the building frontages to allow larger shop windows. The completed frontages fit seamlessly into the shopping street and what was once a run-down series of small low-grade retail outlets is now a retail attraction operated by two well-known High Street names.